All we know Reliance Jio sim is now available more than one smartphone users. There are a wide variety of Micromax and YU Andorid phone users who also want to get the Reliance Jio sim for his handset. But most of the Micromax users does not know how to get Reliance Jio sim on Micromax Android phone. Recentaly Reliance company provide offer to get free Reliance Jio sim for different Micromax Andorid phone users. If you have Micromax Android phone. If you have any given listed Android phone of Micormax or YU then you can easily get free Reliance Jio sim from any nearest Reliance Digital Store or Digital Xpress Mini Store’s. Micromax Canvas Pulse 4G, Micromax Canvas Nitro 4G, Micromax Canvas Knight 2, Micromax Canvas 5, Micromax Canvas Evok, Micromax Canvas 6 Pro,Micromax Canvas 6, Micromax Canvas Blaze 4G, Micromax Canvas Fire 4G, Micromax Canvas Fire 4G plus, Micromax Canvas Xpress 4G, Micromax Canvas Blaze 4G Plus, Micromax Canvas Pace 4G, Micromax Canvas Mega 4G, Micromax Bolt Selfie, Micromax Canvas Mega 2, Micromax Canvas Unite 4, Micromax Canvas Fire 6, Micromax Canvas Sliver 5, Micromax Canvas Juice 4G, Micromax Canvas 5 Lite, Micromax Canvas 5 Lite Special Edition, Micromax Unite 4 Pro, Micromax Canvas Play 4G, Micromax Canvas Amaze 4G, Micromax Unite 4 Plus, Micromax Canvas Tab. If you have any given handset then you can easily get Reliance Jio sim on Micromax Android phone. You just have to take few simple steps to get your exclusive offer code to get free Reliance Jio sim on Micromax Android phone. Step 1: Install and download MyJio and other related apps from Google Play Store. Step 2: After finish the installation of all apps on your handset, set the network on “4G (recommended)” on your Android phone. 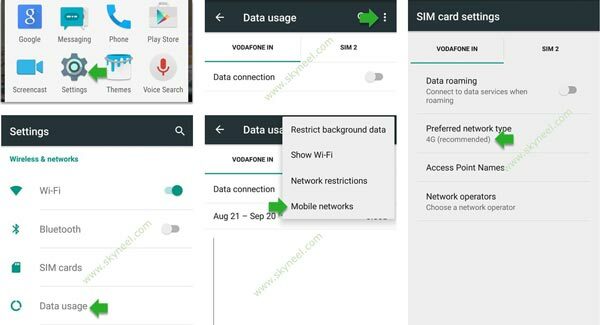 For this you have to tap on the “Settings” > tap on the “Data usage”option > you will see three vertical dots on top right side, tap on it. > tap on the “Mobile networks” > tap on the “Preferred network type” > Now, set 4G (recommended) option. Step 3: Tap on the Myjio app on your Android phone > tap on the “Open” button > tap on the “Get Jio SIM” option. Step 4: Tap on the “Agree and Get Jio Offer” option > Fill your First, Last name along with your mobile number and tap on the “Submit” button. Now you will get OTP code which automatically fill in the box, otherwise you have to check the OTP code and fill in the box and tap on the “Submit” button. Step 5: If you GPS location is turn off then turn on your GPS location. Now, set your location, state and city and tap on the “Next” button. You will get offer in few steps window tap on the “Next” button. Step 6: Now, you will get exclusive offer coupon code in the “Generate offer code” window. Write down this code or take the picture of this code and tap on the “Next” button. Now, you can get the list of document just like ID and Address proof which you have to submit to Reliance Digital Store or Digital Xpress Mini Store to get the sim, tap on the “Next” button. Step 7: You can find the map or address of nearest Reliance Digital Store or Digital Xpress Mini Store again tap on the “Next” button. Now, your can see the pending steps list to collect and activate the Reliance Jio sim from the store and avail your Jio offer and finally tap on the “Done” button. After following all these steps you have to go nearest Reliance Digital Store or Digital Xpress Mini Store submit your documents with passport size photo (if necessary) and get the Reliance Jio sim. Now you should get a sms from company within 48 hours to verify your number. To activate your Reliance Jio sim then you have to dial “1977” number from your handset. You have to give last four digits of your ID card during the tele-verification. 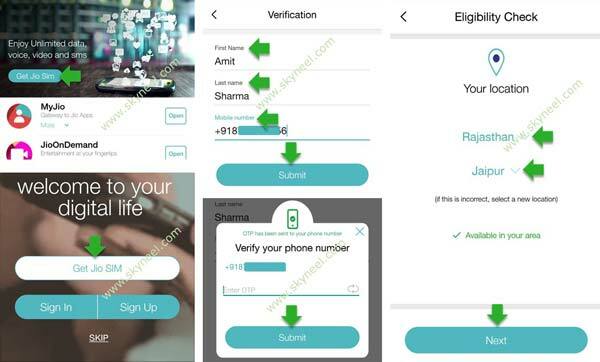 After finish the verification process you should get a message from the company that your SIM is activated and you are ready to use the Reliance Jio sim on your handset. You can not only get the benefit of free sms, video and voice calls but also use unlimited high speed internet data for the period of 3 months. I hope this guide is useful to get Reliance Jio sim on Micromax Android phone users and get the benefit of this offer. Don’t waste your time immeditely get the Reliance Jio sim and get free access of 4G internet, using VoLTE voice calling, video calling feature and also send free sms for 90 days. Yes Jio is working well in yu yureka pluse. Hi Krishna don’t worry your Jio SIM is working properly on Micromax Yu Yureka Plus.